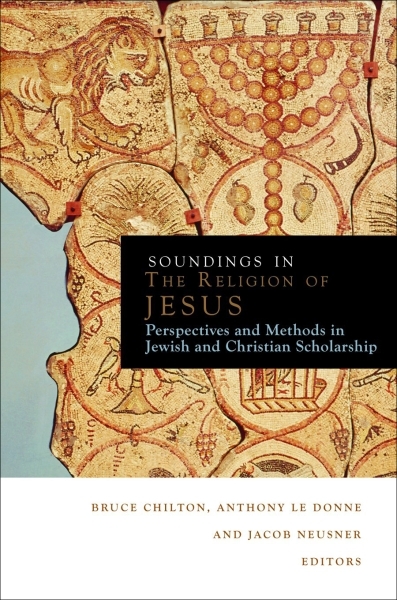 Editors Bruce Chilton, Anthony Le Donne, and Jacob Neusner recently put together a fantastic volume on perspectives on Jesus and Jewish-Christian Dialogue called Soundings in the Religion of Jesus: Perspectives and Methods in Jewish and Christian Scholarship (Fortress, 2012). Anthony Le Donne, it may help you to know, is a founding member of the “Jewish-Christian Dialogue and Sacred Texts consultation” of SBL. My assumption is that this book comes out of that consultation work. As you might guess, a serious concern for almost all of the contributors is the problem of anti-Semitism in Christianity and in New Testament studies (and especially “Jesus” scholarship). By recognizing Jesus’ own “Jewishness” and commitment to his own heritage, Christians in this discussion desire to engage in fruitful conversation with Jews about Scripture and religion. This discussion seems necessary, in part, because there appear to be an influx of Jewish historians and religious scholars interested in the historical Jesus (and also Paul). Now, I read nearly every essay in this book and most of them have very rewarding arguments, but for the sake of keeping my review simple and to the point, I will discuss 4 “eye-opening” points made in this book. 1. Translation matters. Leonard Greenspoon wrote the first essay entitled “Translating Jesus and the Jews: Can We Eradicate the Anti-Semitism without Also Erasing the Semitism?” Greenspoon notes how some Jewish scholars have expressed concern that normal NT translations show an anti-semitic bias in the way Jesus and his disciples are represented. He raises the concerns of William Barnstone (literary critic) who argues that NT translators have perpetuated an agenda where “all the good people [in the NT] are Christians and the evil ones are Jews” (Greenspoon’s summary of Barnstone, see p. 13). Barnstone uses the example of the name Iakobos in the Gospels. In Matthew’s genealogy, translators gloss Iakobos (the patriarch) as “Jacob,” while the disciple of Jesus called Iakobos is translated as “James.” In Luke 3:29 (Luke’s genealogy), Iesous is translated “Joshua” by most English translations, but, of course, the main character of the Gospels is also Iesous, always translated “Jesus” when referring to the messiah. Greenspoon finds this kind of trend disconcerting, but he is not quite as ready as Barnstone to call this conscious acts of anti-Semitism. Barnstone has recommended a re-translation of the NT (which he has undertaken) that re-semitizes the names: Joshua, Jacob, Miryam, Kepha, Saul… While Greenspoon is sympathetic to this attempt, he is skeptical that it will make much of a difference, or push forward Barnstone’s final agenda. Nevertheless, he still thinks this work of helping modern readers to understand the Jewish background and context of Jesus and his discipels worthwhile, especially if such efforts “enable and enhance positive relations between and among faith communities.” (p. 27). [T]o render ‘scribes and Pharisees’ as ‘Scripture scholars and religious experts’ is no solution, obscuring as it does why scribes were called ‘scribes’ (a learned minority who could write! ), and that there was a significant body called ‘Pharisees’ (an appropriate English rendering of perushim) who were not the only ‘religious experts’ (p. 162). What about the perennially disconcerting use of “hoi Ioudaioi” in the Gospels? Dunn admits that translating it as “the Jews” has contributed to Christian anti-Semitism, but he believes that other circumlocutions are, in the end, not the best decision (such as “Jewish leaders” or “Judeans”). He believes the translator must always be faithful to translating as close as possible to the original meaning of the words. Dunn’s final words on the matter are appropriately sobering: “The real responsibility (and guilt) lies with those who have failed to point out such features…The fault lies not with the translation so much as the way the translation has been used” (p. 162). …we cannot confidently accept as historically accurate the disputations as Mark himself narrates them, for he inspires no confidence that he knows enough about any of the six Jewish leadership groups as they functioned in Jesus’ day but, instead, appears to co-opt materials that he does not fully enough command (p. 79). This, says Cook, has had a disastrous effect, fueling hatred against the Jews that condemned Jesus. Regev does not take this kind of approach. He casts doubt on the Gospels historically, but only to say Jesus was not as dangerous as he seemed and did not wish to overthrow Judaism, so Jews should not see him as the founder of an anti-Semitic movement. From a different perspective, Donald Senior writes about Matthew’s Gospel and concludes that, in fact, this evangelist does a pretty darn good job portraying Jesus “in strongly Jewish tones” (81). Senior does not think Matthew has an “inerrant” historical account of Jesus and his context, but there are enough historical ducks in a row that it can be trusted as a reliable window into the world of Jesus (see 83). Dunn, I would think, is in much agreement with Senior. In fact, Dunn dismisses Cook’s source-critical reading as superfluous and artificial. 3. Is “inter-faith” the ideal? The last two insights both come from A-J Levine’s reflection on the whole conversation. She thinks to put it in terms of “faith” is privileging a specifically Christian way of thinking. Wow! I never thought of that before. 4. What are the goals of “dialogue”? Again, A-J Levine teaches an important lesson. That means, for most people involved in Jewish-Christian dialogue, the concern is not about growing in faith. The agenda is not a religious one on either side, but primarily a civil or humanitarian goal – to foster a sense of mutual respect and explore common ground so that people with different religious views can live peacefully and cooperatively. Again, wow! I always thought it was about religion and faith, but Levine is right. Those who hold the strongest religious views never enter true dialogue. So, there you have it – a 1500 word teaser of a fascinating and fantastic book. I say this a lot, but let me add that Fortress Press did a great job producing this book – font, binding, cover, layout – all very attractive. I highly recommend this book to anyone interested in the historical Jesus as well as modern concerns over anti-Semitism and how Christians view Jews and Judaism. Nijay, thanks so much for your careful reading.